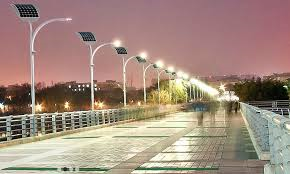 The New York based company, EnGoPLANET, has introduced to Las Vegas Kinetic Energy Pads and Solar Streetlights powered by footsteps and sunlight. Four streetlights and eight kinetic pads have been installed and are working in downtown Boulder Plaza sidewalks, and in Las Vegas’ Art’s District Plaza, between Main street and First Street. The kinetic pads are imbedded in the ground with a small solar panel mounted on top. Micro generators sit below the kinetic pads, creating energy, every time someone steps on them. Each footstep can create 4 to 8 watts, depending on the pressure of the step. The light poles will also include charging stations with universal serial bus ports. These kinetic pads are sure to be a big hit during First Friday events, with increased crowds walking up and down the sidewalk, taking part in America’s Clean Energy Act.